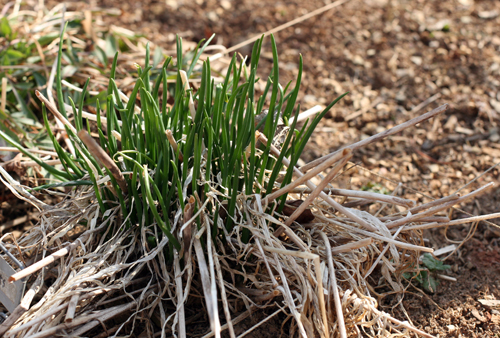 The very first signs of life I see in the garden each year are chives. Beautiful green shoots that peek from beneath the blanket formed by last year’s growth, the late-fall crop that laid down their lives with the first hard frost to protect the next generation. 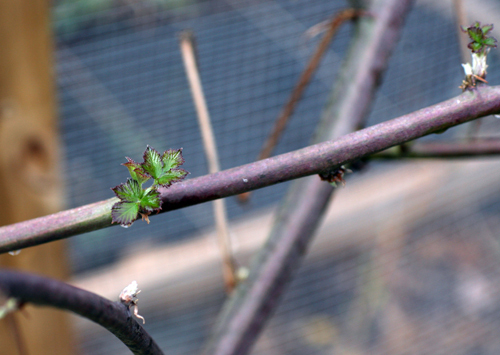 They were already popping up two weeks ago when I ventured into the garden for the first time since fall. 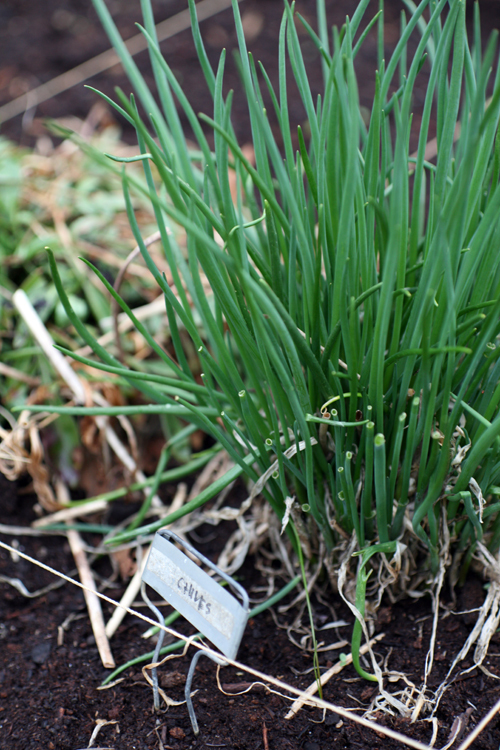 The new chives are thankfully resistant with help from the old - they managed to survive the late snow we had just last week. When I visited the garden after work one evening to check their progress I was pleased to find that they were ready for me to cut. 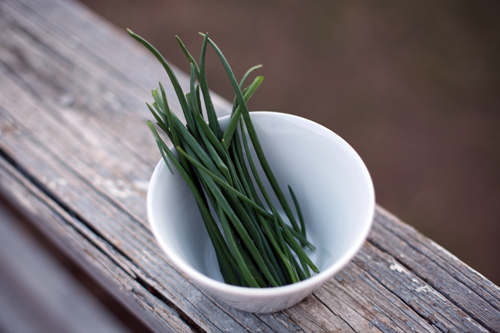 Chives are one of my favorite herbs to use in the kitchen because they are so versatile. Toss them with fingerling potatoes to roast, sprinkle them raw over top of an omelet, fold them into batter to be baked in cheddar biscuits...their mild, onion-like flavor allows for endless possibilities. I’d bookmarked this NY Times recipe for an herb frittata earlier this month and knew as soon as I spotted those lovely bits of green from over the fence that the time had come to try it. I'd never made a frittata before. 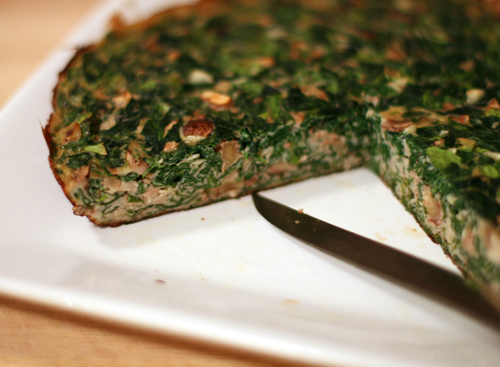 It seemed to me that it would be a difficult task and, having never read a frittata recipe before, I assumed that it would contain whole milk and cheese (similar to a quiche) and not be terribly productive to my weight-loss efforts. Boy was I wrong, on ALL assumptions. For one, the process was really easy. As long as you have a decent non-stick skillet and some patience, this dish really couldn't be easier. And I used just two dishes to make it...two! I really like a quick and simple recipe, but add "very little clean-up" to its list of attributes and I am in love. Second, the frittata is much healthier than any quiche recipe I've made. The main contributor to its healthfulness? A lack of crust. That's right...no crust. And...no cheese. The greek yogurt makes the consistency so creamy that you'll never miss it. 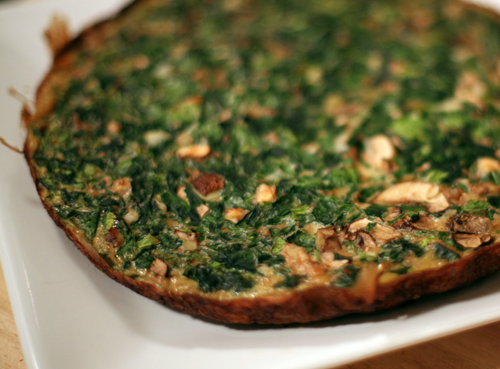 Plus, this particular recipe is loaded with spinach and herbs, not to mention heart-healthy walnuts and yummy mushrooms. Bring a large pot of generously salted water to a boil. Fill a bowl with ice water. 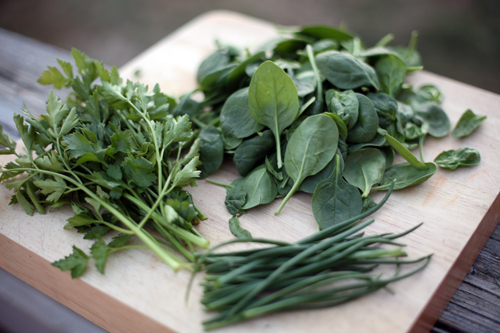 Add the spinach to the boiling water and blanch for 10 to 20 seconds. Transfer to the ice water to cool for a few minutes, then drain and squeeze out excess water. Chop finely. Beat the eggs in a large bowl. Stir in the yogurt, walnuts, salt and pepper. 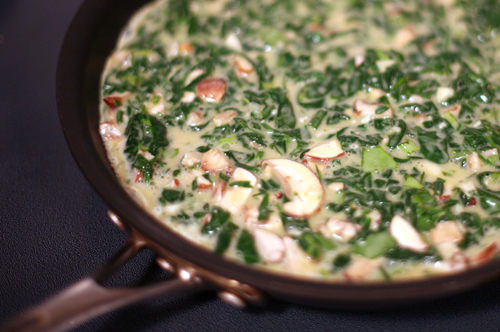 Add the spinach, herbs and garlic, and mix together well. Adjust salt and pepper. Let sit for 30 minutes, stirring occasionally. Add the mushrooms. Heat a 10-inch nonstick skillet over medium-high heat and add the olive oil. Drop a bit of egg into the pan, and if it sizzles and cooks at once, the pan is ready. Pour in the egg mixture, scraping every bit out of the bowl with a rubber spatula. Roll the pan to distribute the eggs and filling evenly over the surface. Shake the pan gently, tilting it slightly with one hand while lifting up the edges of the frittata with the spatula in your other hand, in order to let the eggs run underneath during the first few minutes of cooking. Turn the heat down to low, and cover the pan. Cook 10 to 15 minutes, shaking the pan every once in a while, until the frittata is just about set. Meanwhile, light the broiler. If the frittata is not quite set on the top, place under the broiler, about three inches from the heat, for one to two minutes, watching closely, until just beginning to color on the top. Do not allow the eggs to brown too much or they’ll taste bitter. (I wound up leaving it under the broiler for about 4 minutes total, until just starting to brown). Remove from the heat, allow to sit in the pan for five minutes or longer, then carefully slide out onto a platter. Serve warm or at room temperature. Tina at Carrots 'N' Cake has released a call for guest bloggers...how fun! If you haven't checked out Tina's blog yet you really should. She's got great daily tips for creating a healthy lifestyle through good eats and exercise. Guest blogging is a great way to spread your blog words to further reaches, so consider sending her an email with some ideas! Ryan at Chasing Daylight made bella eats enchi-ritos! So glad you enjoyed them, Ryan!